Now that the sticker shock has faded and the hassle of finding a contractor has been solved, I’m getting pretty excited about my upcoming kitchen renovation! I had a lot of fun this past weekend figuring out cosmetic details like cabinet colors (dove gray on the bottom cabinets, pearl white up top), recessed lights versus light fixtures (can lights everywhere except over the kitchen sink) and picking out a new sink (this double bowl farmers sink from Ikea with this crazy faucet... weee!!!). It’s a huge relief to start from scratch, especially because for the past year, the house hasn’t really felt like mine at all. Aside from the previous owners’ poor choices and bad DIY jobs that I just didn’t have the time or money to fix, having three male housemates also didn’t help. These guys didn’t just shut doors, no; they slammed them, resulting in several broken doors and cabinet latches. And believe me, that kind of forceful handling wasn’t just limited to the doors. At one point, I calculated that somebody had broken something (a door, a latch, or some kind of plateware) every week since moving in. Needless to say, I started hiding away my more prized possessions in my room to avoid any more casualties. And that’s how I lived this past year — my stuff still in boxes, in my very own house. Grim. No wonder it didn’t feel like my own home. With the upcoming renovation in the works, I’ve ended their month-to-month leases with 45 days notice. Although I am sorry to see that income go (after all, it’s what paid for this kitchen renovation), I mostly feel relief. Being a landlord was pretty hard on me, especially since my tenants were also my roommates. It’s a position that I hope I won’t have to be in again — at the very least, not for a while. Because truth be told, 45 days is proving itself to be a surprisingly long time since my roommates aren’t in any particular hurry to find a new place. The problems we had as a house still remain, the biggest one being our overcrowded kitchen. What is an Eton mess? 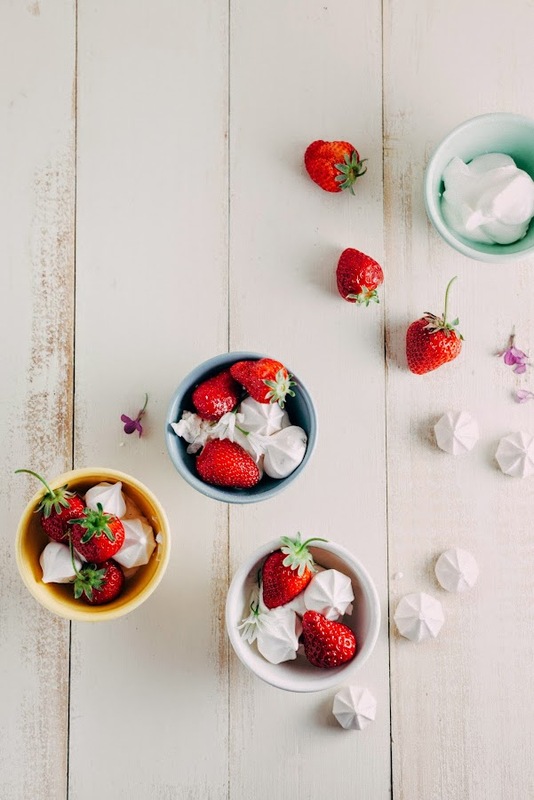 A traditional English dessert consisting of a mixture of strawberries, pieces of meringue, and whipped cream. It's not something you often see here in the States, but it was something that recently popped up on my radar after checking out this crazy slideshow of British desserts from Serious Eats. Apparently it gets its name from that fancypants boarding school that all the British prime ministers and members of the royal family went to, which is where it was allegedly invented. Since I had made the meringues ahead of time, the dessert came together in less than 5 minutes, and believe me they were gone faster than that. I used fresh strawberries (they were first of the season and nearly caused a riot at the farmer's market! ), but you can substitute with any other fresh fruit you like. I've included my trusty meringue recipe (the base of which is from the free Christmas ebook I wrote last winter), but to save time, you can also use store bought meringues. You can make the meringues up to 3 days in advance. I was handing these out to different friends, so I divided up the portions into ramekins. If serving at home or at a party, no need to divvy up into individual portions — you can throw all the ingredients together in a larger serving platter for a more traditional effect. The recipe only makes enough for 2 people — you can easily double or triple to feed more. The best way to eat an Eton mess is to give the dessert a good stir before consuming. This will crush up the meringues and strawberries into the cream, giving each mouthful a varied texture (which is what I loved about the dessert). Preheat the oven to 200 (F), centering the rack in the oven. In a medium, heatproof bowl, combine 2 large egg whites, 1/2 cup granulated sugar and a pinch of cream of tartar. Place the bowl over a pot of simmering water, making sure that the bottom of the bowl does not touch the water. Whisk the mixture until the sugar has dissolved and the whites are warm to the touch, testing the mixture with your fingers. Once the mixture is warm and the sugar has dissolved, transfer the mixture to the bowl of a freestanding electric mixer fitted with the whisk attachment. Whip, starting on low speed before gradually increasing to high speed, until soft peaks form (around 5 minutes). Add 1/2 teaspoon vanilla extract and continue beating until stiff peaks form. Once the meringue is stiff, transfer to a pastry bag fitted with a 1/2-inch or 3/4-inch star tip. Pipe 1-inch drops onto two baking sheets each lined with parchment paper — there's no need to get the meringues perfect, they're going to end up crushed in the dessert anyway! 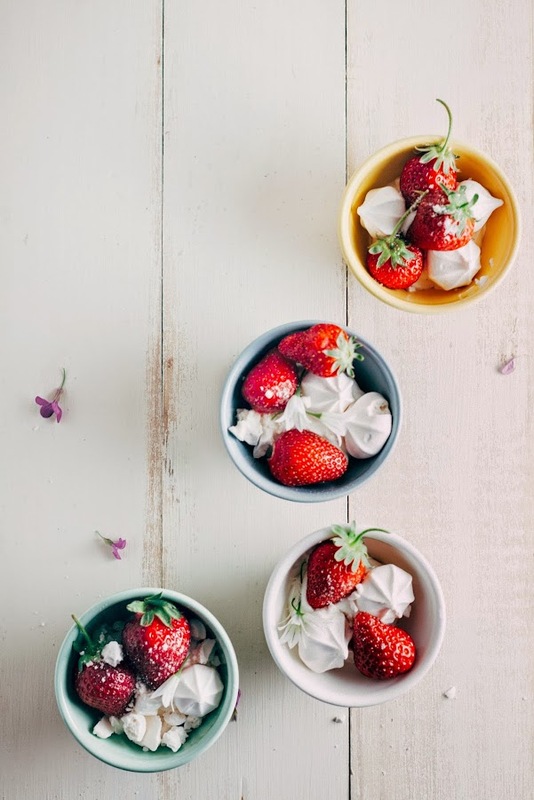 Bake in the preheated oven for 1 1/2 hours, until the meringues are crisp on the outside but soft on the inside — be careful not to overbake, or the meringues will start to brown and lose their pure white color. Once the meringues are finished baking, turn off the oven heat and crack the oven door to allow the meringues to cool slowly to room temperature, about 3 to 4 hours. 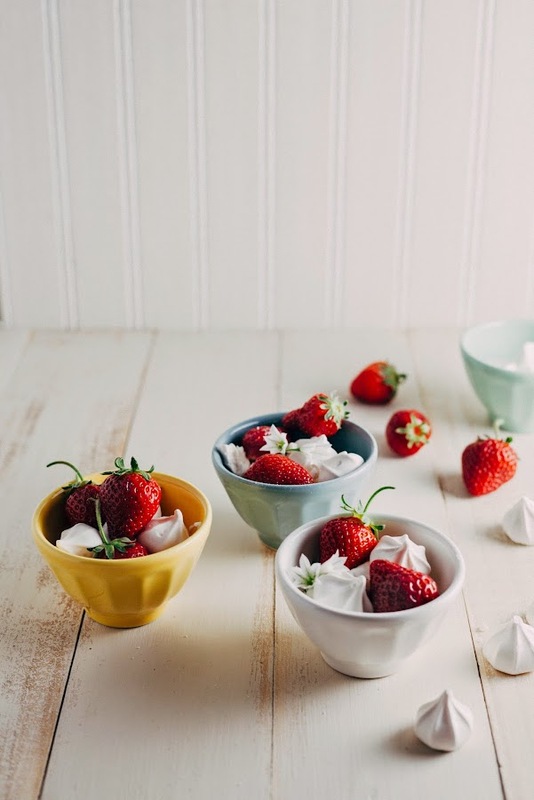 In a medium bowl, toss together 1 cup quartered and hulled fresh strawberries and 1 tablespoon granulated sugar. 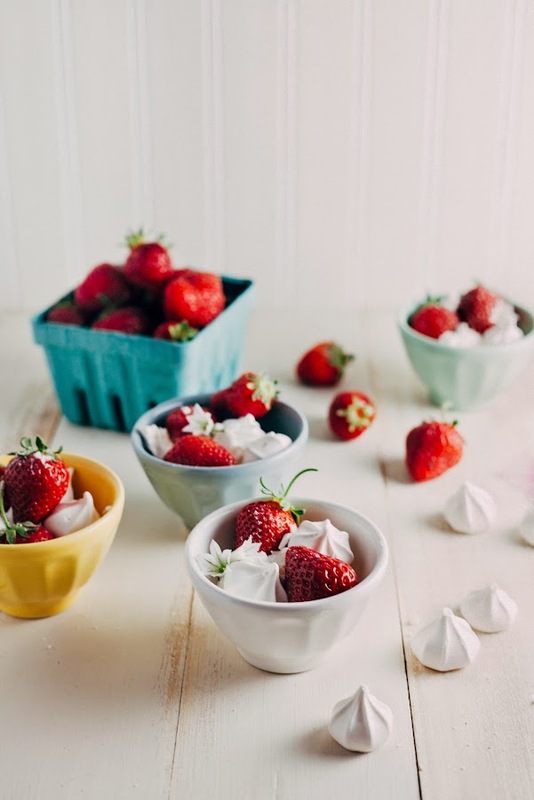 Set aside for 10 to 15 minutes to allow the strawberries to macerate. The sugar will draw out the juices from the strawberries, making them more fragrant and delicious. In the bowl of a freestanding electric mixer fitted with a whisk attachment, combine 1/2 cup confectioner's sugar and 1 teaspoon vanilla extract. Whip on medium-high speed until soft peaks form — be careful not to overmix, or you'll end up with butter! 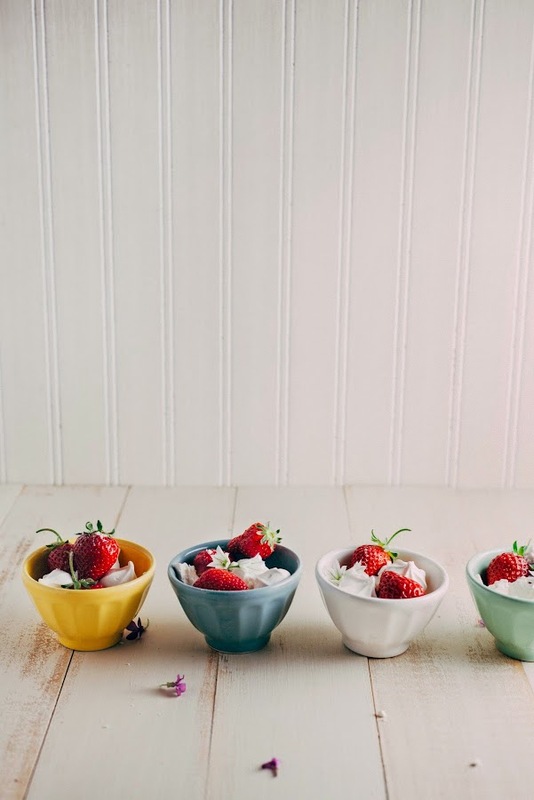 Divide the whipped cream, strawberries and meringues between four ramekins. Serve immediately. OMG i am obsessed with eton mess. i made it once for a family thing and it was literally a mess and people thought i was weird... i just want the whole of america to know what an eton mess is so they won't be afraid. also IMPORTANT: i have that exact same domsjo. have you bought it yet? i spend lots of minutes of my time keeping it clean because it shows EVERY LITTLE CRUMB. like, you can't just pour out some coffee and walk away, you have to pour out coffee, and then rinse it all down. (probably what grown ups do anyway? i don't know). i love this sink because of how massive it is and how many dirty dishes it can hold, and it looks cute, but honestly if i had to do it all over again, i would also look into some other options... perhaps a traditional metal sink. ok ok, i hope i'm not messing up your plans, but i just wanted to mention the cleaning time because i sure as heck didn't think about it before i bought it because i was too heart-eyed with how it looked. OMG! Good to know about the DOMSJO. Thanks for letting me know! I also didn't get past thinking about the whole cleaning up thing and was too busy being in love with it for its size, looks, price etc. I'll definitely explore some other options now! OMG these are the cutest. You've given me a new mission: find eton mess in London. (!!!!!!!) Also EVERYTHING else on that list. I'm super excited to try Hummingbird Bakery!!!!! 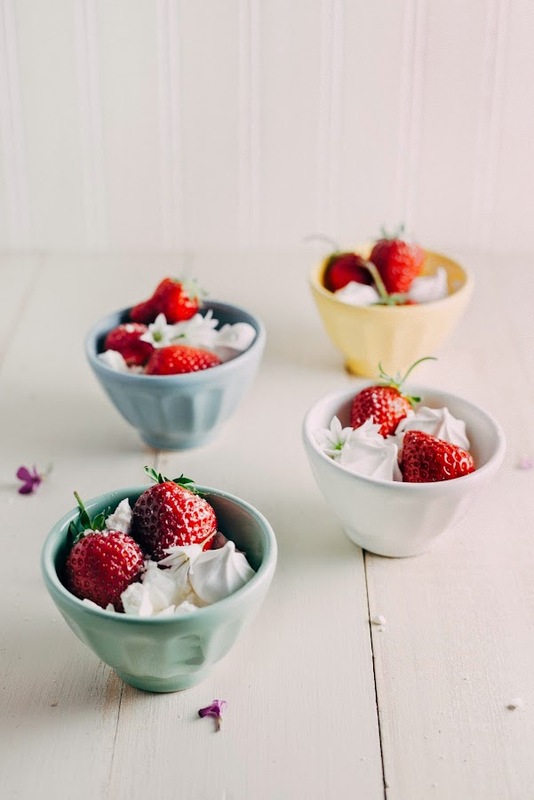 I love eton mess, so simple and satisfying! Wishing you a speedy kitchen reno AND roomate-move-out situation! Hooray for a full kitchen remodel! That will be so much fun (once you get past the stress/impatience part of it). I love that this is called a mess - it sounds like the perfect dessert to me, and I love having them individualized too! How elegant! I've never had an eton mess, but I'll have to try it now.